New Delhi: India climbed one spot to 130 in the latest United Nations Human Development Index (HDI), indicating slow progress in improving people’s living standards in Asia’s third-largest economy. The country was ranked 130 among 188 nations in the Human Development Report 2015 released on Monday by the UN Development Programme (UNDP). India’s ranking of 135 in the previous year’s report was revised to 131, the report said. Inequality, particularly in education, has contributed to India’s poor ranking in the human development index, the report said. 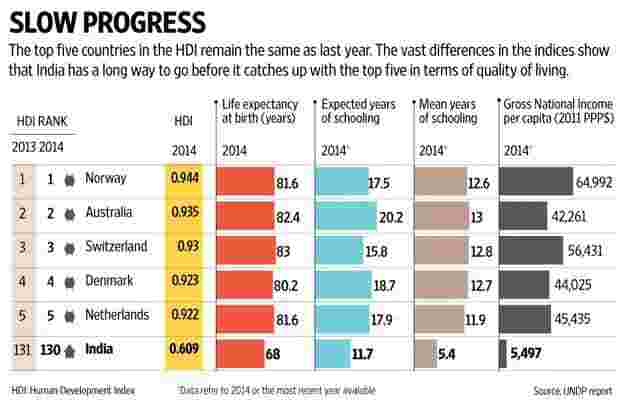 “India loses 28.6% HDI due to inequality, largely due to inequality in education (42.1%)," it said. “Among BRICS (Brazil, Russia, India, China and South Africa), South Africa has the highest loss due to inequality at 35.7% and lowest is for Russia at 10.5%." Education experts say inequalities in education have not been not addressed by policies such as the 2009 Right to Education, although it is enshrined in law. “This Act does not address the inequality in education at all, it focuses on the inputs and infrastructure, not the quality of education," said Parth J. Shah, head of New Delhi-based Centre for Civil Society think-tank. “There is no reference to learning outcomes and this is what we hope the new education policy will address." Only 42.1% of India’s population aged 25 years and older had at least some secondary education, the UNDP report said, adding that government spending on education was 3.8% of gross domestic product between 2005 and 2014. In the 34 years between 1980 and 2014, India’s HDI value increased from 0.362 to 0.609, an increase of 68.1% or an average annual increase of about 1.54%," said a press statement from UNDP. This year’s report focused on the nature of work and how new technologies and innovations influenced it. “Through work, people can build a secure basis for their lives, enabling them to make long-term decisions and establish priorities and choices. They can also sustain stable households, particularly if they use their income prudently on food and nutrition for their family, on education and health for their children, or for savings," the report said. Haoliang Xu, assistant administrator and director of the UNDP’s Regional Bureau for Asia and the Pacific, who was cited in the UNDP statement, drew out the link between education and work, noting that: “In order to ensure that the work-force is capable of adapting to rapidly changing demands, governments need to make strategic investments into education and health care." India has been stressing the need to skill Indians to ensure the 12 million youth who enter the labour force every year are job-ready. Prime Minister Narendra Modi has created a separate ministry to deliver on his “Skill India" mission. The HDI report said that global participation of women in the labour force—who are generally less educated than men—have fallen slightly in recent years, mainly because of the reductions in India (from 35% in 1990 to 27% in 2013) and China (from 73% in 1990 to 64% in 2013). India’s female literacy rate among youth aged 15-24 years was 74.4% as against the male literacy rate of 88.4%, according to the report. It said the expected years of schooling in India has been stagnant at 11.7 since 2011. Also, average years of schooling at 5.4 has not changed since 2010. India’s 2014 HDI value of 0.609 is below the average of 0.630 for countries in the medium human development group but above the average of 0.607 for countries in South Asia, the report said. In South Asia, countries which are close to India in the HDI rankings are Bangladesh and Pakistan, who have rankings of 142 and 147, respectively. The average loss due to inequality for medium HDI countries is 25.8% and for South Asia it is 28.7%. Among India’s HDI parameters that have improved between 1980 and 2014 were life expectancy at birth, which increased to 68 years in 2014 from 67.6 in the previous year and 53.9 in 1980. Per capita gross national income was $5,497 in 2014—up from $5,180 in 2013 and $1,255 in 1980.